Aesculus pavia is a deciduous small tree or shrub forming a handsome, rounded shape of cane-like branches. In early summer it produces a fiery display of deep red flower panicles. The foliage is dark green, compound leaves that turn reddish brown in autumn. N.B. This plant is not readily available in Australian nurseries. Soil: Well drained soils are best. 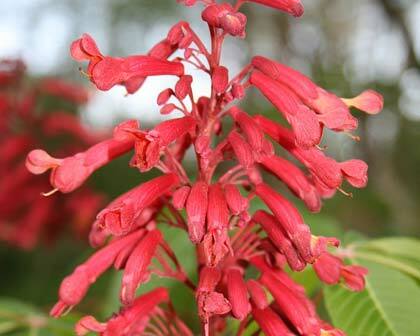 Other Species: Ornamental cultivars like the low-growing Aesculus parvia Humilis are particulalry good for garden use. 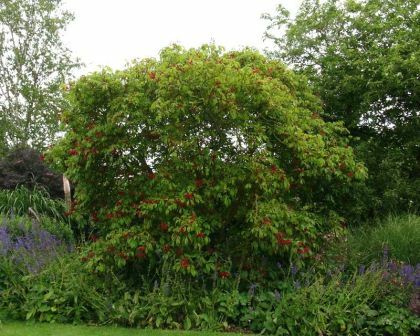 Aesculus hippocanastanum - Horse Chestnut. Comments: The horse chestnut family of trees produce nuts that resemble the chestnut but are bitter and inedible.